business cards, CD/DVDs silts are available free of charge. This promotion may be used with other valid promotions (including those found on external websites). 1 foil stamped area on Side 1 of uncoated 100lb Dark Blue Linen stock. D2 disc slit on left pocket, with C3 business card slits on right pocket. This expandable folder offers plenty of room for clients' important insurance documents. Its dark blue stock has a corporate color that makes the metallic silver logo seem even brighter. The stock's linen texture also complements the smooth text. A mix of serif and sans serif fonts pays tribute to tradition yet adds a modern twist to the tagline. 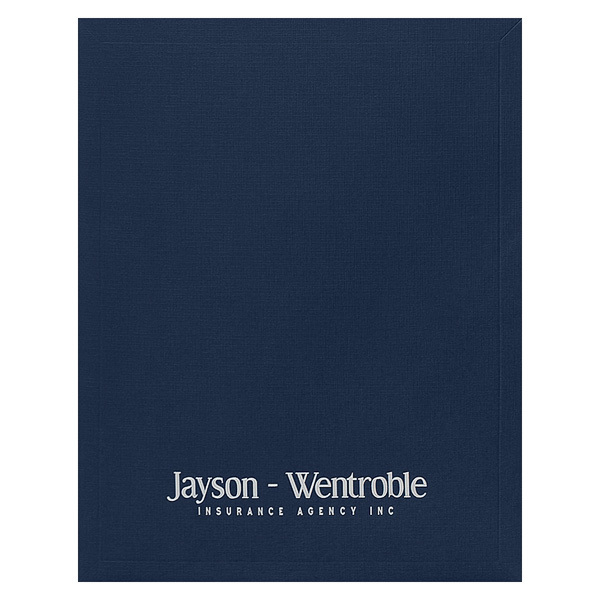 Inside, a disc slit lets Jayson-Wentroble Insurance provide digital documents in addition to hard copies. Twin pockets are specially equipped with Conformer® expansion scores. Each pocket can expand up to 3/8", for a total of 3/4" storage space. This one-size-fits-all item ships and stores easily, then maintains a smooth look whether carrying a single sheet of 8 1/2" x 11" paper or an entire presentation packet. Its scores can even become a design element, as they resemble an embossed border. Custom pocket slits hold a business card on the right and a 5" disc on the left. The slits' unusual curved cut is fun and memorable. Their rounded shape also contrasts the square exterior corners for added visual appeal.